It sure has been a hot summer this year and I for one can tell you that our airco sure didn’t get a chance to draw unemployment this season. So, what about our primates? Besides the fact that people cover outdoor enclosures to protect their primates from the heat, many also provide them with a small pool that helps them cool off during those hot summer days. For those where their primates lives inside their house, it gets a little harder to provide a way to cool off. 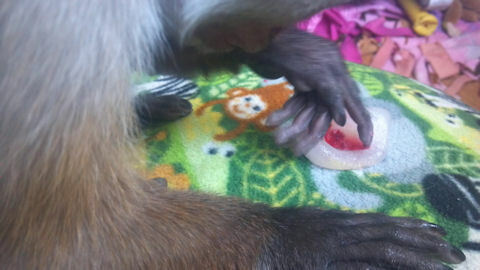 One easy way to help your primates cool off is by using ice cube treats. 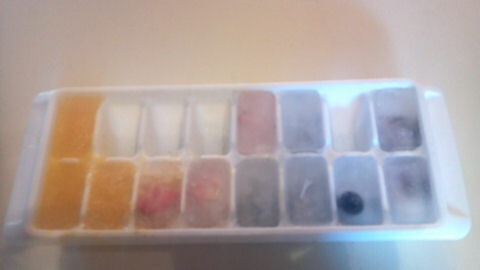 The idea behind ice cube treats is pretty simple: you just drop treats into an ice cube tray, add water and freeze. It’s a great enrichment item for these hot summer days and it will guaranteed keep your monkey entertained for a long time. We typically freeze fruits like blueberries and strawberries but you can of course also freeze veggies like cauliflower and broccoli. Another great way to battle boredom which takes virtually no effort at all!